Btw, what are you planning for there, commercial project, open source or combinations ? Are you planning for actual production, assuming enough interest ? This project is not open source. For a start I have had to sign an NDA with ESSTech so that precludes publishing the circuit. Secondly this design is based on an existing DSP design which is not in the public domain. A lot of the code I am reusing from another project which is not public domain. Analog Devices tools are not free and nor is the ICE although the newer tools have come down in price somewhat. I can provide TTL compatible I2S signals. Do you need a master clock ? Having said that the existing design is based around an ES9018 DAC and ES9112 ADC with 8 channels balanced/unbalanced output. recourses would take it even further. the edge of technology today. Is this it ? 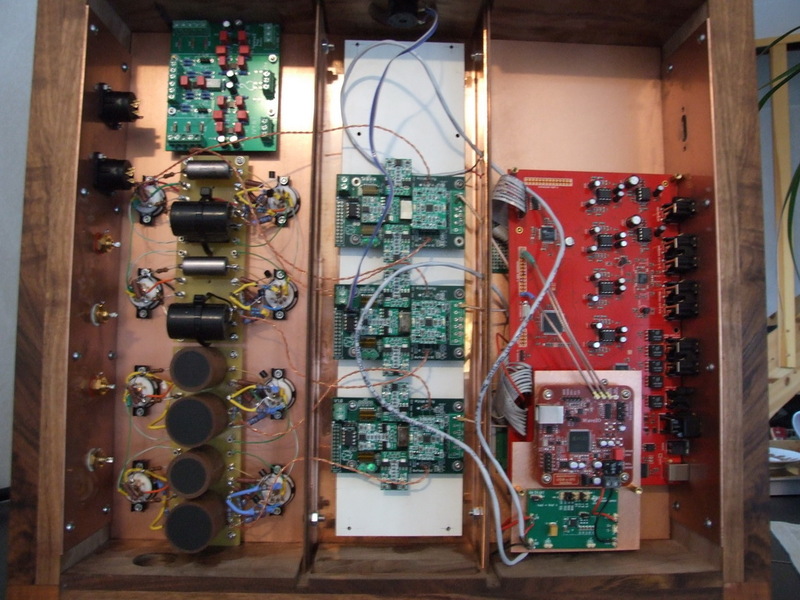 My dsp, you could probably tell from the picure what the dac's are (I'm keeping them by the way) . This is what I have been looking for, for quite sometime. I have an active setup based on minidsp. I would love to replace that with a better DAC. I will be following this thread closely. I am interested if I can have it without the ESS ADC (I mean bought unpopulated) and price not to expensive : I only need one optical digital stereo in . good choice on the adsp214xx . very interested in your lineup of hardware dsp boards . 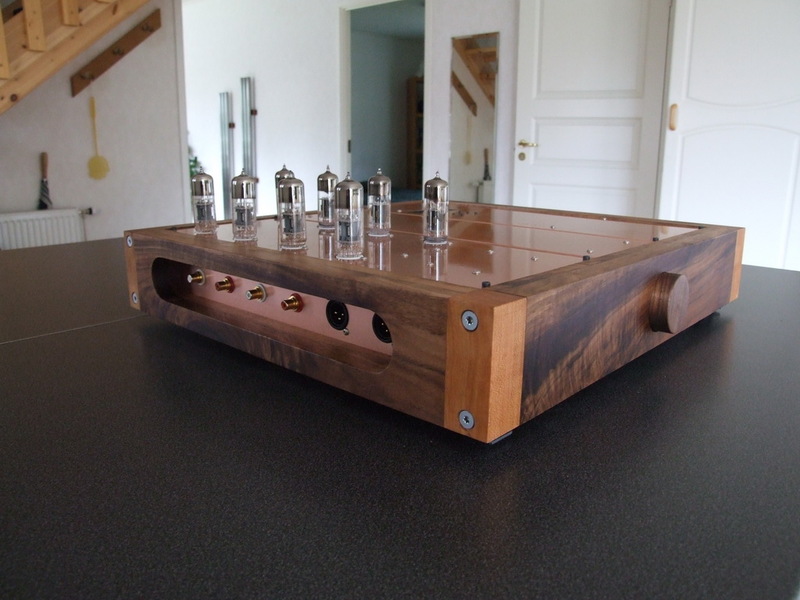 Is that a solid copper or copper plated chassis ? You will only need the Digital Audio IO board and not the Analog Input board which would offer the most cost savings rather than manufacturing another run of the boards without the ADC. Could you give us a description of the digital side of your project ? many channels, four or five ? This particular DSP is configured to use four I2S channels to drive the 8 channel SABRE DAC. It is possible to route these signals off board but I chose to do everything on board in one compact board layout. Having said that I have located all of the asynchronous digital IO on another dedicated board. These consist of S/PDIF coax and optical inputs as well as an AES/EBU input and S/PDIF output. The reason why I have chosen this DSP over others is that it is designed for audio applications and contains a number of useful audio related peripherals which minimizes the chip count. This is a truly interesting Project. Will it be possible to use more than one DSP system, e.g. one master controller and the others as slaves? Can you please describe how the "Bit-perfect level control on each individual channel"this is implemented its gain range?